As you can see, we are getting these late. The Town Manager and the Police and Fire Chief have been working on getting the system down to get these out. 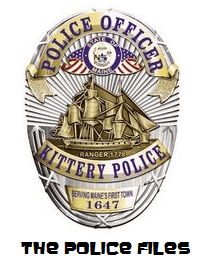 Check http://www.kitterypolice.com/police-logs.html for current logs as they are posted. Preliminary reports suggest that they will be posted every wednesday. This may change. I was told that the Fire Department Logs will be posted at the end of every month. http://www.kitteryme.gov/Pages/KitteryME_Fire/Fire%20Logs. Getting the logs out apparently is still work in progress but I have been assured that the efficency of getting these out will get better. Until then, here is what we have. 7:17 a.m. – An officer responded to Wilson Road regarding dogs running at large. 8:27 a.m. – Stray dogs were reported on Stevenson Road. 11:39 a.m. – An officer assisted the fire department on US Route One. 12:47 p.m. – A two vehicle motor vehicle accident occurred on US Route One. 1:04 p.m. – A disturbance on Gorges Road was reported. 1:52 p.m. – A citizen came into the police department to report a motor vehicle accident that occurred on State Road. 2:28 p.m. – An alarm received from a residence on Tower Road was investigated and determined to be a false alarm. 3:11 p.m. – An officer assisted another agency. 3:57 p.m. – An officer responded to Remicks Lane regarding an unsupervised dog. 4:01 p.m. – A two vehicle motor vehicle accident occurred on Route 236. 4:39 p.m. – Information regarding an incident on the I-95 Freeway was forwarded to another agency. 5:16 p.m. – Following a report of erratic operation on Route 236, John W. Sutherland, 64, of 38 Central Street, Woburn, MA was arrested for operating under the influence. 10:33 p.m. – An officer attempted to serve paperwork on Priscilla Ter. 9:12 a.m. – A resident of Jefferson Lane called regarding an animal issue. 11:45a.m. – Paperwork was served on Shapleigh Road. 11:54 p.m. – Paperwork was served on Pepperrell Road. 12:37 p.m. – Another agency was asked to check their area for a vehicle. 1:26 p.m. – A two vehicle motor vehicle accident occurred on US Route One. 3:47 p.m. – An officer investigated a theft on Oak Ter. 5:52 p.m. – A hit and run accident occurred on US Route One. 8:10 p.m. –Following a 911 call from Norton Road Heisha C. Letch, 34, of 78 Norton Road Unit 6 was arrested for domestic violence assault. 10:42 p.m. – Following a traffic stop on Route 236 Douglas Burnell, 57, of 105 Fore Road, Eliot was summonsed for possession of marijuana. 11:10 p.m. – A report of a suspicious vehicle on US Route One was investigated. 11:53 p.m. – An officer checked on suspicious activity they observed on US Route One. 1:25 a.m. – Following a traffic stop on Walker Street a juvenile was arrested for operating a vehicle without a license and theft by unauthorized use of property. 9:22 a.m. – Paperwork was served on Old Dennett Road South. 12:05 p.m. – An officer attempted to serve paperwork on Shapleigh Road. 1:22 p.m. – a two vehicle motor vehicle accident occurred on Route 236. 1:37 p.m. – An officer responded to US Route One for an animal complaint. 2:10 p.m. – A citizen came into the police department to report an offense. 2:18 p.m. – A resident of Moore Street came into the police department to report a violation of a court order. 2:50 p.m. – An officer served paperwork to an individual at the police department. 5:14 p.m. – Paperwork was served on Priscilla Ter. 5:20 p.m. – A wallet was reported lost on Dame Street. 5:38 p.m. – Following a report of a shoplifter from a business on US Route One Danielle Chase, 20, of 27 Royal Crest, Rochester, NH was arrested for theft by unauthorized taking or transfer. 6:23 p.m. – An officer responded to US Route One for a two vehicle motor vehicle accident. 8:56 p.m. – An officer checked on suspicious activity they observed on Williams Ave.
9:09 p.m. – A call was received reporting suspicious activity on US Route One. 9:26 p.m. – An attempt was made to serve paperwork on Dahlia Drive. 11:12 p.m. – An officer checked on suspicious activity they observed on US Route One. 11:21 p.m. – The area of the I-95 Freeway was checked to assist another agency. 12:46 a.m. – Suspicious activity on the US Route One Bypass was investigated. 1:16 a.m. – Following a motor vehicle stop at the intersection of Love Lane and State Road Michael D. Stephens, 25, of 43 Adele Drive, Dover, NH was summonsed for operating after license suspension. 2:47 a.m. – Following a motor vehicle stop on US Route One Jennifer P. Welton, 20, of 9 Madbury Road Unit 301, Durham, NH was arrested for operating vehicle without license. 3:16 a.m. – A 911 call regarding an animal complaint was received from a residence on Jewett Lane. 3:35 a.m. – An officer investigated suspicious activity they observed on US Route One. 9:33 a.m. – A citizen came into the police department to report an animal complaint on MacDougal Street. 10:15 a.m. – The animal control officer responded to State Road regarding an animal complaint. 10:50 a.m. – An animal issue was investigated on Tuckers Cove. 11:31 a.m. – Officers responded to Moore Street for a report of disorderly conduct. 1:30 p.m. – A report of suspicious activity was investigated on US Route One. 1:49 p.m. –A motor vehicle accident involving two vehicles occurred on US Route One. 4:38 p.m. – A report of a violation of a court order on Moore Street was determined to be unfounded. 6:53 p.m. – Officers assisted the fire department at the scene of a structure fire. 7:42 p.m. – An alarm was received from a business on State Road. Upon investigation it was determined to be a false alarm. 12:19 a.m. – Officers responded to Wilson Road for a noise complaint. 1:12 a.m. – An officer initiated a motor vehicle stop on Hunter Ave.
1:55 a.m. – Following a traffic stop at the intersection of Government Street and Walker Street Heidi C. Schule, 50, of 20 Lilac Lane, Eliot was arrested for operating under the influence. 2:45 a.m. – Officers responded to Government Street for a motor vehicle accident. Upon investigation David M. Laliberte, 32, of 104 Middle Street First Floor, Woonsocket, RI was arrested for operating under the influence. 7:44 a.m. – The animal control officer assisted another agency on State Road. 7:45 a.m. – Suspicious activity was investigated on Dion Ave.
11:09 a.m. – A 911 call from the I-95 Freeway was investigated. 1:36 a.m. – A 911 call from Shapleigh Road was investigated. 1:13 a.m. – An officer initiated a motor vehicle stop on Wilson Road. 12:05 p.m. – An officer assisted a citizen with a landlord/tenant dispute. 12:32 p.m. – A report of suspicious activity was reported on US Route One. 1:45 p.m. – A resident called regarding an IRS scam. 3:57 p.m. – A two vehicle motor vehicle accident occurred at the intersection of Route 236 and Stevenson Road. 5:17 p.m. – Following a traffic stop on US Route One Lowilda Arredondo, 34, of 724 Lake Street, Newark, NJ was summonsed for operating with suspended registration and operating vehicle without license. 9:37 p.m. – An alarm received from Stevenson Road was investigated and found to be a false alarm. 9:35 a.m. – A resident came into the police department to speak to an officer regarding a scam. 10:05 a.m. – Criminal mischief that occurred on Pinkhams Lane was investigated. 11:17 a.m. – An officer responded to the I-95 Freeway to assist another agency. 5:23 p.m. – A citizen called to report an IRS scam. 6:18 p.m. – Officers responded to Cutts Road for a report of a fight in progress. 6:51 p.m. – Following a traffic stop on Woodlawn Ave Jennifer L. Melendez, 26, of 23 Cole Street was summonsed for operating vehicle with expired temporary registration. 9:24 p.m. – Officers responded to Park Ave for a report of a domestic disturbance. Upon investigation Ian P. Renaud, 33, of 8 Park Ave was arrested for violating conditions of release. 12:27 a.m. – An officer initiated a motor vehicle stop on US Route One. 6:40 a.m. – Another agency was assisted on Watts Street. 9:33 a.m. – A motor vehicle accident involving a vehicle and a deer was reported on US Route One. 12:15 p.m. – Officers responded to Brave Boat Harbor Road for an alarm. 12:18 p.m. – An alarm from Halstead Street was investigated. 12:25p.m. – A resident came into the police department to report a lost I-Phone. 12:35 p.m. – A report of criminal mischief on US Route One was investigated. 2:05 p.m. – An officer assisted another agency. 3:04 p.m. – A report of a scam was received. 3:38 p.m. – A two vehicle motor vehicle accident occurred at the intersection of Walker Street and Main Street. 4:04 p.m. – Another motor vehicle accident occurred at the intersection of Walker Street and Main Street. 4:23 p.m. – An alarm received from a location on Stevenson Road was investigated and found to be a false alarm. 4:51 p.m. – A citizen came into the police department to report a violation of a court order. 5:15 p.m. – Following a complaint on Cutts Road, Gregory Alan Swanton, 47, of 9 Old Cutts Road was summonsed for failure to control dog resulting in damage to livestock. 6:05 p.m. –An alarm received from Ranger Drive was determined to be a false alarm. 8:00 p.m. – Another agency was assisted. 9:59 p.m. – Officers responded to Bridge Street for a report of disorderly conduct. 4:57 a.m. – An alarm received from a business on US Route One was investigated and found to be a false alarm. 7:37 p.m. – An alarm was received from US Route One. Upon investigation it was determined to be a false alarm. 9:09 p.m. – An officer served paperwork on Shapleigh Road. 9:17 p.m. – Paperwork was served on Pepperrell Road. 10:33 a.m. – An officer served paperwork on Traip Ave.
2:09 p.m. – An officer responded to US Route One for a report of a motor vehicle accident. 4:53 p.m. – An animal complaint was received from Coleman Ave.
6:45 p.m. – A dog at large on Busdick Drive was reported. 6:48 p.m. – An officer assisted another agency on Oak Ter. 7:45 p.m. – An officer attempted to serve a summons on Old Cutts Road. 7:50 p.m. – An officer responded to US Route One to check on the welfare of dogs left in a vehicle. 8:33 p.m. – A call was received regarding a civil matter on Shapleigh Road. 8:51 p.m. – Officers assisted the fire department at the location of a fire. 8:22 p.m. – A citizen came into the police department to report harassment. 8:28 p.m. – Following a report of a domestic disturbance on Love Lane Teresa M. Smith, 50, of 20 Love Lane was arrested for domestic violence assault. 1:17 a.m. – An officer assisted another agency on Bridge Street. 7:21 a.m. – An alarm from State Road was investigated and found to be a false alarm. 10:57 a.m. – Paperwork was served on Adams Drive. 3:29 p.m. – A citizen came into the police department to report harassment. 7:20 p.m. – A burglary to a motor vehicle that occurred on the US Route One Bypass was investigated. 7:25 p.m. – A report of a dog left alone was received from Manson Ave.
9:51 p.m. – A dog bite occurred in the vicinity of Irwin Street and Howard Street. 8:20 p.m. – A resident came into the police department to report the loss of their license plate. 9:45 p.m. – A report of online harassment was received from Watts Street. 11:02 p.m. – An officer checked on suspicious activity they observed on Route 236. 11:41 p.m. – Officers responded to Wilson Road for a noise complaint. Peace was restored. 12:21 a.m. – A noise complaint was received regarding a location on Wilson Road. Peace was restored. 12:41 a.m. – Suspicious activity that an officer observed on Wilson Road was investigated. 2:31 p.m. – A noise complaint on Goodsoe Road was investigated and determined to be unfounded. 2:35 a.m. – An officer checked on suspicious activity they observed on US Route One. 3:02 a.m. – Following a motor vehicle stop on State Road Arlene M. Hatch, 47, of 65 Northdale Road, West Roxbury, MA was arrested for operating under the influence. 8:01 a.m. – A theft was investigated on Eliot Road. 8:28 a.m. – A theft that occurred on Oak Ter. Was investigated. 9:17 a.m. – An officer responded to Oak Ter. for a report of a theft. 11:37 a.m. – Derek Lahaye, 35, of 17 High Street Unit #7, Winchester, NH was arrested on another agency’s warrant. 11:55 a.m. – An alarm from Pocahontas road was investigated. 5:11 p.m. – Following a report of a domestic disturbance on Ledgewood Drive Shannon Lee Welch, 31, of 500 Ledgewood Drive Unit #L2 was arrested for domestic violence assault. 6:03 p.m. – A theft from a vehicle was reported by a resident of Eliot Road. 9:59 p.m. – An officer responded to Howard Street for a noise complaint. Peace was restored. 2:16 a.m. – A noise complaint was received regarding a residence on Commercial Street. Peace was restored. 12:55 p.m. – A call was received reporting dogs left in a closed vehicle on US Route One. 1:43 p.m. – A resident of Eliot Road called to report burglary to their vehicle. 3:46 p.m. – Suspicious activity on the US Route One Bypass was investigated. 5:45 p.m. – An alarm received from Badger’s Island West was investigated and determined to be a false alarm. 9:15 p.m. – Officers responded to State Road for a noise complaint. Peace was restored. 11:46 p.m. – An officer responded to Cutts Road to investigated suspicious activity. 11:11 p.m. – An officer initiated a motor vehicle stop on Bridge Street. 1:45 a.m. – An officer initiated a call for drunkenness in public. 8:03 a.m. – A disturbance was reported on Wentworth Street. 2:45 p.m. – A two vehicle motor vehicle accident occurred on Rogers Road. 4:02 p.m. – An officer responded to Government Street for a civil issue. 5:32 p.m. – A motor vehicle accident involving two vehicles occurred on State Road. 5:53 p.m. – A cell phone was reported lost on Pocahontas Road. 6:02 p.m. – A report of theft was received from Martin Road. 7:39 p.m. – Paperwork was served to an individual at the police department. 8:45 p.m. – A report of shoplifting was received from a business on US Route One. 10:43 p.m. – Officers responded to Manson Ave to investigate a noise complaint. 11:17 p.m. – A noise complaint was received regarding a location on Dismukes Street. 3:18 a.m. – A report of suspicious activity on US Route One was investigated. 5:54 a.m. – An alarm from a location on Shapleigh Road was determined to be a false alarm. 8:16 a.m. – An officer investigated a burglary to a motor vehicle on Love Lane. 10:21 a.m. – James W. Rabideau, 32, of 96 Broadway Ave Unit #A, Dover, NH was arrested on another agency’s warrant. 11:32 a.m. – A two vehicle motor vehicle accident occurred on State Road. 2:22 p.m. – Michael Ricker, 53, of 60 Church Street, Milton, NH was summonsed for Harassment by Telephone. 2:50 p.m. – A resident came into the police department to report a scam. 3:22 p.m. – An officer investigated a report of theft. 5:19 p.m. – A motor vehicle accident involving two vehicles occurred on State Road. 7:17 p.m. – A report of a theft of a motor vehicle on Charles Hill Road was investigated and determined to be unfounded. 7:42 p.m. – William Michael Yuva, 18, of 4 Dana Ave unit #2 was arrested on a warrant. 8:16 p.m. – An officer attempted to serve a warrant on Cutts Road. 10:25 p.m. – Following the report of the theft of a motor vehicle on State Road Rolinda J. Desjardins of 4 Dana Ave, Unit #21 was arrested for theft by unauthorized use of property. 10:24 a.m. – A Two vehicle motor vehicle accident occurred on the US Route One Bypass. 1:26 p.m. – A report of criminal trespass was investigated on Ledgewood Drive. 1:44 p.m. – The area was checked for a vehicle. 3:12 p.m. – The K-9 officer assisted another agency. 6:30 p.m. – An officer responded to Armour Drive regarding a property dispute. 6:32 p.m. – An officer assisted with a civil matter on US Route One. 9:58 p.m. – Another agency was assisted. 11:15 p.m. – The area of Badger’s Island was checked for a vehicle. 11:51 p.m. – A caller reported harassment on Government Street. 1:28 a.m. – An officer assisted another agency in the area of the Memorial Bridge. 6:02 a.m. – A noise complaint on Rogers Road was investigated. 9:56 a.m. – A motor vehicle accident occurred on State Road involving two vehicles. 3:39 p.m. – A citizen came into the police department to report suspicious activity that occurred on Cromwell Street. 3:55 p.m. – An officer investigated a report of phone harassment. 4:06 p.m. – A report of theft from a business on US Route One was referred to another agency. 8:45 p.m. – Suspicious activity was investigated on Dismukes Street. 9:18 p.m. – An alarm received from a business on US Route One was investigated and determined to be a false alarm. 12:43 a.m. – An officer assisted the fire department on Litchfield Road. 3:45 a.m. – The area of Badger’s Island was checked for an individual. 6:14 a.m. – A report of suspicious activity on State Road was determined to be unfounded. 9:13 a.m. – Criminal mischief on Government Street was investigated. 10:21 a.m. – An officer responded to Armour Drive regarding a civil matter. 11:05 a.m. – Another agency was assisted on Coastal Wood Circle. 1:33 p.m. – Paperwork was served on Shapleigh Road. 1:51 p.m. – Paperwork was served on Pepperrell Road. 2:12 p.m. – A report of criminal mischief was investigated on Drake Lane. 6:07 p.m. – A three vehicle motor vehicle accident occurred on US Route One. 6:36 p.m. – A report of criminal mischief on Watts Street was received. 7:48 p.m. – A citizen came into the police department to report the violation of a court order. 1:33 a.m. – An officer assisted another agency on State Road. 3:48 a.m. – An alarm from a business on Water Street was found to be a false alarm. 7:59 a.m. – An animal complaint of Rogers Road was referred to another agency. 10:23 a.m. – The theft of a bicycle on Whipple road was investigated. 10:29 a.m. – An officer assisted another agency on Eliot Road. 1:13 p.m. – An individual came into the police department to report a motor vehicle accident. 1:49 p.m. – Suspicious activity was reported on US Route One. 3:02 p.m. – A report of theft from a vehicle was reported on the US Route One Bypass. 3:20 p.m. – An alarm received from a business on US Route One was determined to be a false alarm. 4:43 p.m. – A theft report was investigated on US Route One. 5:27 p.m. – A resident of Moore Street called to report a theft. 8:15 p.m. – An animal issue was dealt with on Dennett Road. 10:33 p.m. – An officer responded to Wilson Road for a report of disorderly conduct. 11:56 p.m. – Officers responded to Lori Lane, resulting in the arrest of Nicholas Stoll Shepherd, 22, of 29 Chauncey Creek Road for allow minor to possess or consume liquor and the summonsing into court of Tyler Nay, 20, of 32 Boush Street and Nicholas A. Aikens, 20, of 1233 Ocean Blvd, Rye, NH for minor consuming liquor. 9:27 a.m. – Following an animal complaint on Wallingford Square an animal was taken to Creature Comforts. 11:10 a.m. – An animal complaint was received from the US Route One Bypass. 11:46 a.m. – An officer attempted to serve a warrant of Old Post Road. 1:18 p.m. – An alarm from Williams Ave was investigated and found to be a false alarm. 1:40 p.m. – Following a report of disorderly conduct on Spinney Way Timothy King, 28, of 77 Periwinkle Drive, Rochester, NH was arrested for domestic violence assault, obstructing the report of crime, and reckless conduct. 3:16 p.m. – An officer responded to State Road for an animal complaint. 5:4 p.m. – Officers responded to Idlewood Lane, resulting in the arrest of Bethany M. Marshall, 37, of 1 Idlewood Lane Unit 21 for domestic violence assault. 6:49 p.m. – An ATV complaint was received from Cedar Drive. 11:33 p.m. – An officer initiated a motor vehicle stop on US Route One. 7:44 a.m. – An animal issue was referred to another agency. 11:11 a.m. – A report of suspicious activity was referred to another agency. 12:16 p.m. – A suspicious vehicle was checked on Rogers Road. 3:00 p.m. – A citizen called to report a camera that was lost on Pepperrell Road. 3:21 p.m. – A report of animal neglect on Cutts Road was investigated. 3:51 p.m. – Paperwork was served to an individual at the police department. 5:12 p.m. – A report was received of a key lost on Seapoint Road. 5:20 p.m. – A resident came into the police department regarding a civil matter. 6:04 p.m. – A dog was reported lost from a residence on Kittree Lane. 6:05 p.m. – A two vehicle motor vehicle accident occurred on Wyman Ave.
8:01 p.m. – An officer investigated a report of driving to endanger that occurred in the area of Manson Ave and Cole Street. 8:10 p.m. – Suspicious activity was reported on Ridgewood Drive. 8:49 p.m. – Ashleigh Jean MacKay, 25, of 78 Bellevue Ave Unit 1, Haverhill, MA was arrested on a warrant. 2:56 a.m. – Gary W. Mohr, 23, of 78 Betty Welch Road Unit 98 was arrested on a warrant. 4:07 p.m. – An officer responded to State Road for a report of a theft. 4:46 p.m. – Ian P. Renaud, 33, of 8 Park Ave was arrested on another agency’s warrant. 6:43 p.m. – An officer responded to Haley Road for a town code violation. 11:28 p.m. – A resident of Rogers Road reported suspicious activity. 8:03 a.m. – A bicycle was reported stolen on Stimson Street. 12:22 p.m. – An officer checked on suspicious activity they observed on Gorges Road. 7:31 p.m. – A report of suspicious activity on Haley Road was received. 7:49 p.m. – A motor vehicle accident occurred on Ranger Drive. 11:42 p.m. – A report of an assault on Oak Ter. was investigated. 5:07 a.m. – An animal complaint was received from Busdick Drive. 8:01 a.m. – An article was found on State Road. 8:56 a.m. – Justin A. Gillen, 32, of 16 Tersolo Road, Haverhill, MA was arrested on a warrant. 9:06 a.m. – An officer assisted the fire department at the scene of a brush fire. 9:08 a.m. – Assistance was given to another agency. 11:20 a.m. – A citizen came into the police department to report fraud. 11:49 a.m. – An officer responded to Seapoint Road to investigate suspicious activity. 1:02 p.m. – A call was received regarding disorderly conduct on Manson Ave.
2:28 p.m. – Following an animal complaint on Government Street the animal was taken to Creature Comforts. 4:21 p.m. – A two vehicle motor vehicle accident occurred on US Route One. 5:42 p.m. – An officer responded to Haley Road for a report of a sick animal. 6:19 p.m. – An article was reported lost from a location on Walker Street. 8:15 p.m. – An alarm from a location on Stevenson Road was determined to be a false alarm. 8:51 p.m. – Suspicious activity on Wilson Road was investigated. 10:48 p.m. – Following a traffic stop Timothy J. Moffat, 23, of 144 State Road was arrested for operating under the influence. 2:56 a.m. – A report of suspicious activity on Ledgewood Drive was investigated and determined to be unfounded. 3:48 a.m. – An alarm from a business on Badgers Island West was found to be a false alarm. 6:28 p.m. – A theft was investigated on State Road. 9:22 a.m. – An animal was transported to Creature Comforts after being found on Rogers Road. 2:17 p.m. – A motor vehicle accident occurred on Shapleigh Road. 2:21 p.m. – An officer responded to a business on State Road to check on suspicious activity. 2:32 p.m. – A theft from Moore Street was reported. 3:21 p.m. – A report of a violation of a court order was received. 3:44 p.m. – A two vehicle motor vehicle accident occurred on Badgers Island. 4:00 p.m. – An article was found on Badgers Island West. 4:34 p.m. – A report of fraud was received from a resident of Maple Ave.
4:44 p.m. – A two vehicle motor vehicle accident occurred on US Route One. 5:30 p.m. – A report of phone harassment was received. 5:39 p.m. – A citizen came into the police department to report a motor vehicle accident that happened on US Route One. 11:22 p.m. – An officer responded to Walker Street to assist another agency. 11:29 p.m. – A report of a violation of a court order was investigated. 12:09 a.m. – An alarm from a business son Route 236 was investigated and found to be a false alarm. 4:39 a.m. – Officers assisted another agency. 10:24 a.m. – Following an animal complaint on Dennett Road an animal was taken to Creature Comforts. 1:27 p.m. – An officer spoke to a citizen regarding suspicious activity on Rogers Road. 1:51 p.m. – An Alarm for a business son Ripley Road was found to be a false alarm. 4:01 p.m. – A two vehicle motor vehicle accident occurred on US Route One. 4:38 p.m. – A motor vehicle accident involving two vehicles occurred on US Route One. 7:43 p.m. – Officers responded to Sterling Road for possible disorderly conduct. 9:16 p.m. – Following a motor vehicle stop on Old Dennett Road Steven Gary Dunton, 49, of 34 Elaines Way, Unit F, Eliot was arrested on a warrant as well as violating conditions of release and fugitive from justice. 12:05 a.m. – A report of a barking dog on Halstead Street was investigated. 1:27 a.m. – Officers responded to Coastal Woods Circle for a noise complaint. Peace was restored. 10:07 a.m. – A resident came into the police department to report criminal mischief that occurred on Foyes Lane. 1:30 p.m. – An article was reported lost on Rogers Road. 4:33 p.m. – Another agency was assisted on Whipple Road. 4:50 p.m. – An officer assisted the fire department on government Street. 4:53 p.m. – Dogs reported to be in distress on US Route One were checked on. 6:56 p.m. – A motor vehicle accident occurred on Seapoint Road. 10:27 p.m. – An officer initiated a motor vehicle stop on the US Route One Bypass. 11:24 p.m. – A motor vehicle stop was initiated on US Route One. 4:15 a.m. – An alarm received from a business son US Route One was investigated and determined to be a false alarm. 10:59 a.m. – An officer assisted another agency on US Route One. 1:34 p.m. – An officer responded to a business son US Route One for a report of shoplifting. 3:27 p.m. – A two vehicle motor vehicle accident occurred on Pepperrell Road. 4:51 p.m. – An officer checked on an animal complaint on US Route One. 7:33 p.m. – Dogs were reported running at large on Pinkhams Lane. 5:17 a.m. – An officer responded to Williams Ave to assist the fire department. 8:21 a.m. – An alarm received form a location on Rogers Road was determined to be a false alarm. 10:46 a.m. – Another agency was assisted on Rogers Road. 3:04 p.m. – A wallet was reported lost on US Route One. 4:29 p.m. – Following an animal complaint an animal was taken to Creature Comforts. This entry was posted in General Town News on September 7, 2014 by Chuck Denault.